The small forward (SF), also known as the three, is one of the five positions in a regulation basketball game. Small forwards are typically somewhat shorter, quicker, and leaner than power forwards and centers, but on occasion are just as tall. The small forward position is considered to be perhaps the most versatile of the five main basketball positions. In the NBA, small forwards usually range from 6' 6" (1.98 m) to 6' 9" (2.06 m). 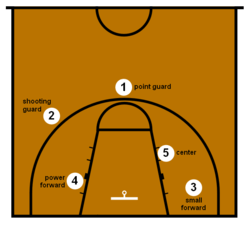 The ideal position for a small forward would be between the key and three-point line. 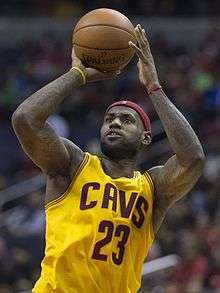 Small forwards are primarily responsible for scoring points, defending and also often as secondary or tertiary rebounders behind the power forward and center, although a few, such as LeBron James, have considerable passing responsibilities. Many small forwards in professional basketball, however, are prolific scorers. The styles with which small forwards amass their points vary widely, as some players at the position, such as Golden State Warriors' Kevin Durant are very accurate straight up shooters, while others such as Metta World Peace (formerly Ron Artest), Gerald Wallace, and Jerome Kersey prefer to "bang inside", initiate and/or not shy away from physical contact with opposing players, while others are primarily slashers such as Carmelo Anthony and LeBron James who also possess jumpshots. One common thread among all kinds of small forwards is an ability to "get to the line", that is, having opposing players called for committing shooting fouls against them, as fouls are frequently called on the defense when offensive players "take the ball hard" to the basket; that is, the offensive players aggressively attempt post-up plays, lay-ups, or slam dunks. Therefore, accurate foul shooting is an imperative skill for small forwards, many of whom record a large portion of their points at the foul line. Small forwards who are defensive specialists are very versatile as they can often guard multiple positions using their size, speed, and strength such as Kawhi Leonard and Paul George. ↑ Recruiting Nation (November 28, 2006). "Versatility is key for small forwards". ESPN.